So lately, in my vacation time, I have been fiddling with Uzebox. It’s a game console from just a ATMega644 mcu and a AD725 (RGB-to-NTSC converter) chip. Thats the whole idea. The RGB signal is created by a manual 3:3:2 resistor based DAC, and audio is pure PWM signal. The awesome part of this console is the “kernel”, written by Uze (Alec Bourque), which has several video modes available, and a 4 channel audio mixer, all done in interrupts, so that when you code stuff to this console, you don’t have to think about the clock cycles of your code, as the interrupt will always update the screen and audio output “behind the scenes”. The project is now also supported well by a small but great community, that has helped Uzebox with more video modes, games, and even a realtime emulator! You can buy yourself a Uzebox at Adafruit, or just download the emulator from the code.google.com repository. Games and demos(with or without source code) can be downloaded from the wiki. My additions can be found in the SVN repo. Every year, I team up with raider.no to arrange a party in Hurdalen, or around the Oslo area. And one of the things that is important for us (especially me and William), is to create a cool opening show, using our own innovative technology. We don’t have a lot of money in the organization, so we tend to also develop stuff that already exists. This year, we wanted to do the timing of the show entirely in our own system, as we weren’t satisfied with the Avolites Pearl systems own “show timing” system. So we split up the task in two daemons and a GUI. The two daemons are written in C, and the GUI in Perl (using the Catalyst Framework). The first deamon is the “DMX daemon”, which handles existing DMX data from the Pearl mixer as the rest of the night will be run from this board. This is transferred via network over the ArtNet protocol. It also listens for our own udp DMX-commands, which includes simple operations like, fade (linear), blink, subtract, add, etc. These functions allows external scripts and programs to send simple commands to control the lights. For example “fade channel 1 from 0 to 255 in 2 seconds”. Which would then automatically execute, without the client having do anything more. You can also group together a bunch of actions in a “transaction”, and then have it execute as soon as you send the “end transaction” command. The resulting DMX data is sent to the Enttec DMX dongle connected to this computer. The system is so lightweight, that there was no noticeable delay from using ArtNet->DMXDaemon->EnttecDongle over network, than using the direct DMX output from the board. The nice thing is that, if we want, the show daemon can forcibly stop all data from the Pearl mixer, or even alter the data using add/subtract/max/min commands. The next daemon is the show daemon, this takes complete scripted shows from the database (created by the GUI), and converts them to commands to be sent to the DMX daemon. This daemon uses (lib)jackd2 to fire events at the exact time according to the sound file playing in a external program like Ardour, which sends timecodes via jackd. The show daemon has functions to group together effects that will be executed at specific timestamps. Here’s a link to a overview of how we wired it all up for the show. The whole system is kept open-source at github. I’m feel that I am starting to get the hold of C programming. But every now and then, I get these “ahaaa” moments, that I am a bit embarrassed about. One of these “aha”‘s I experienced today is how/when C handles initialization of variables where you don’t explicitly initialize them yourself. Here i deliberately did not initialize any of the variables to make an example. The first two variables will automatically be initialized with 0 before your main() function is executed. The last variable lives in the stack and will not be initialized unless you explicitly do it yourself. So it will probably have a ‘random’ value. Thats kind of handy to know about ;) I feel like this probably is one of the first things you usually learn about C, but I had totally missed this. Nice to know. Also if you use Valgrind to check your code, it can be very good at following uninitialized stack variables. It will actually follow uninitialized memory bit-wise. First I thought the memory was initialized to 0 at compile-time, but after some reading, I learnt that the compiler records the amount of uninitialized memory for global and static variables, and stores the amount of data required in the BSS segment of the program. This way the executable will not grow in size in line with the amount of uninitialized data. For this reason some people call the BSS segment for the “Better Save Space” segment. 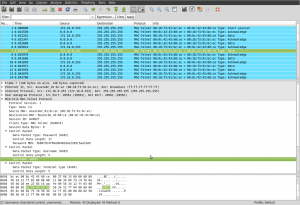 Earlier, I wrote about a Wireshark plugin for dissecting Mac-Telnet packets. Now I have created an open source application for connecting to a RouterOS router via its MAC address from Linux without having to install Wine. At the time of writing the project is still in “alpha” stage. But it is fully functional. Though it will probably be rewritten soon. I feel that the second time you write the same application, it tends to be more robust and thought through.. The first time is more of a proof of concept, and I let myself do a lot of short-cuts, just to be able to see it working. The source code can be found at github. Just find the “download source” link at the top of the page. To compile it, simply untar it, and compile it with “make” . Because it needs to alter the frame headers, it uses RAW sockets, which means that you will need root access to use this tool. HMG is my name of the found router, set in the Identity section of the router. MAC       MAC-Address of the RouterOS device. Use mndp to discover them. # ./mactelnet --help Usage: ./mactelnet <ifname> <MAC> <username> [password] Parameters: ifname Network interface that the RouterOS resides on. (ex: eth0) MAC MAC-Address of the RouterOS device. Use mndp to discover them. username Your username. password Your password. Tip: Log out using CTRL+D on your keyboard. Omni Flux sent me a patch that speeds up the MNDP discovery time by sending out a MNDP request before waiting for replies. Thanks! He also informed me that his tests showed that you could send all the mac-telnet traffic to- and from- the broadcast address. This means that you would not need socket_raw (read: root privileges) capabillities to be able to send data to the router. So the latest version of mactelnet, now also as a binary .deb package below, can be used without root privileges, unless you don’t want all data from your session to be broadcasted on your local network. You can optionally use the “old” method, where it uses the destination routers mac address as destination instead of broadcast. I was searching on the Internet if there were any MAC-Telnet clients for linux/posix, since using terminal.exe in wine is problematic sometimes, as wine gives it access to only one of the NICs in your computer. I didn’t find any clients, but I found this nice reverse engineering of the protocol, which interested me, because I’ve always wondered how it was made, just not enough to check myself. But this guy has done his homework and then some in reverse engineering of Mikrotiks protocol. This gave me an Idea to create a MAC-Telnet client myself, and I started some testing with perl to check if I was able to send the correct packets to my mikrotik router. At first you might think; thats easy! All packets via the mac-telnet protocol uses UDP packets, with both source- and destintation port: 20561. But you can’t send these packets with your normal socket wrapper library, because you need to set the mac-addresses in the network frame to something other than the source/destination IPs corresponding ARP entry. To go into details: When you send Mac-Telnet packets as a client, you need to send your packets going from your ip to ip 255.255.255.255, but with the router you want to telnet as the destination mac address in the ethernet frame. (even though the ip is set to 255.255.255.255). To test this in perl, I used Net::RawIP from CPAN, which worked just like I wanted to. The only problem is that you need to have root access to be able to do raw packets. 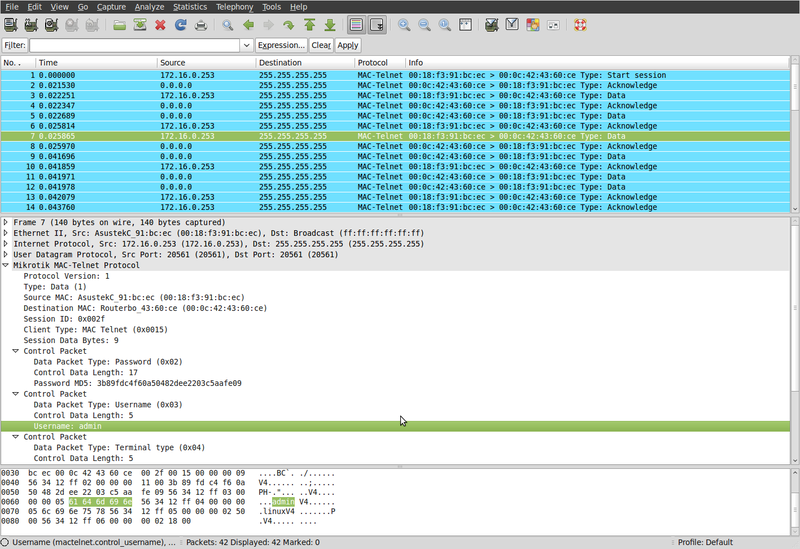 Anyways, I looked at the packet I sent with my test script, and the response from the RouterBoard with Wireshark. Even though I got it to work, I felt I was having problems reading the packets very easily: Reading omniflux’s protocol description, and then looking at the hex dump of the packet. So I decided to make a dissector plugin for Wireshark (ethereal), so I could debug the packets easier. Just patch this in from the root of the wireshark sources. Posted June 21st, 2010 in C, routeros.